This shot from the Hubble Space Telescope shows an edge-on view of the star-forming galaxy NGC 7090, which is located about 30 million light-years from Earth. A gorgeous new photo by the Hubble Space Telescope confirms that a faraway spiral galaxy is indeed churning out new stars at a rapid rate. The new Hubble image captures a galaxy called NGC 7090, which is found about 30 million light-years from Earth in the southern constellation Indus (The Indian). 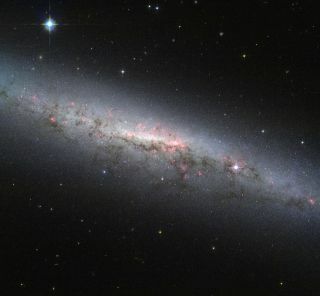 The edge-on shot shows the galaxy's disc and bulging central core — which is likely full of cool, relatively old stars — as well as a number of pinkish regions scattered throughout NGC 7090. These pink areas reveal the presence of huge clouds of hydrogen gas, researchers said. Such clouds are the raw materials of which stars are made, providing striking visual confirmation of several recent studies that have classified NGC 7090 as a star-forming galaxy. Also visible in the image are numerous intricate dust lanes — dark regions especially prominent in the lower half of the galaxy's disc. These areas appear dark from Hubble's vantage point because dust is absorbing much of the light emitted from the bright center of NGC 7090. While dust has frustrated the efforts of observational astronomers for decades, it does not present an impenetrable veil. Dust is largely transparent at near-infrared wavelengths, so some instruments can peer behind it, researchers said. And at even longer wavelengths — such as those used in radio astronomy — researchers can study the dust itself to learn how such clouds contribute to star formation. The photo was taken using the Wide Field Channel of the Advanced Camera for Surveys aboard Hubble. The image combines orange light (colored blue here), infrared (colored red) and emissions from glowing hydrogen gas (also colored red). A version of this image was entered into the Hubble’s Hidden Treasures photo processing competition by contestant Rasid Tugral. Hubble's Hidden Treasures, which has now wrapped up, invited astronomy enthusiasts to search Hubble's archive for amazing images that the public has never seen. The Hubble Space Telescope, a joint effort of NASA and the European Space Agency, launched in April 1990. It has made more than 1 million science observations over its long lifetime, and the instrument is still going strong.